Under-fire Germany star Sami Khedira on Thursday laughed off a cheeky offer of early flights home for the holders from a Swedish reporter ahead of their crunch World Cup clash. Holders Germany will be under intense pressure in the Group F clash in Sochi on Saturday against Sweden after suffering a shock 1-0 defeat to Mexico in their first match of the tournament. The Juventus midfielder kept his cool when a Swedish tabloid reporter handed him a home-made return ticket for the entire German squad. “I don’t think we will need that until July 16,” said the smiling Khedira. The World Cup final takes place in Moscow on July 15. The Germans are deadly serious ahead of the Swedish match, knowing a second defeat will effectively send them home at the end of the group stages. Despite calls to drop him, Khedira insists he can handle the pressure and shore up the German midfield, which was badly exposed by the Mexicans. Ex-Germany stars Lothar Matthaeus and Stefan Effenberg said Khedira should be dropped after his woeful display. “We have to play smarter, not like schoolboys, we have to play all together,” he said. “If the holes are as big as they were against Mexico, you’d need Usain Bolt and Carl Lewis to close the gaps — which we’re not,” he said about himself and defensive midfield partner Toni Kroos. Should head coach Joachim Loew opt to drop Khedira from his starting line-up, the 2014 World Cup winner can take it. “I do not have a problem with it at all. It’s not about names and playing in every game,” he said. 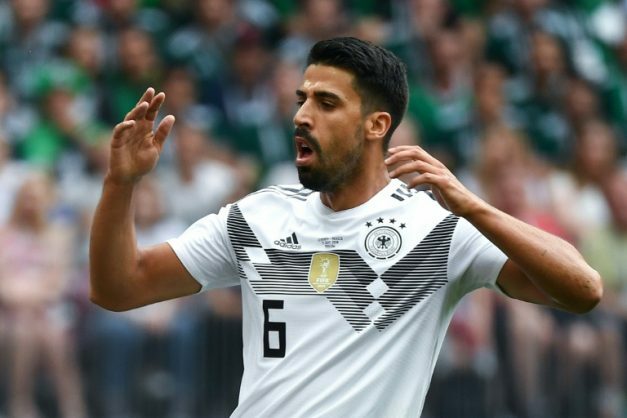 Loew described Khedira as “indispensable” before the World Cup started but the midfielder is aware of criticism levelled both at him and Kroos from Germany’s defence. “We should not let ourselves be tempted by the situation and ignore a task, just because it’s tempting to push forward,” said centre-back Mats Hummels in Sochi in a thinly veiled dig. Khedira knows the spotlight will be on him in Sochi but has the experience after 76 internationals to rise to the occasion.